Discussion in 'RGSS3 Scripts (RMVX Ace)' started by TheoAllen, Jun 30, 2014. This is my first battle system script and my masterpiece script so far. At first, I made this script for my own personal use. Back then when Ace was released, I always wanted an English version of Tankentai. But I heard nothing about the translation. I thought it was impossible tankentai to be translated to English. 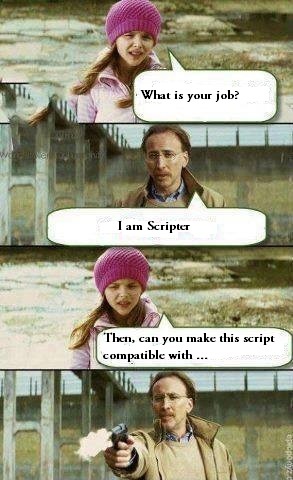 Moreover, it has bad compatibility to other scripts. Then I looked at avalaible battle scripts, and not even a single script I like. I just don't get the idea of those scripts. Then, hence my ambition started. This script was greatly inspired from Tankentai VX version and Eremidia : Dungeon! game. It's mainly aimed for free sequence animated battle without standard. I mean, there is no such a thing like "play all frames in row x" (the reason why I did this is because I hate standards). You can pick any grid in your spriteset. You can even use unorganized spriteset if you're too lazy to make one. As long as the format is consistent. 2018 Update: Officially released in game editor! Q: Is it has a high compatibility?A: Maybe yes, maybe no. I alter the damage flows. Any script that also alter the damage flow will highly not compatible. Such as YEA - Area of Effect or Lunatic Damage. But I haven't touch the HUD so var. I only provide animated battle sprite. 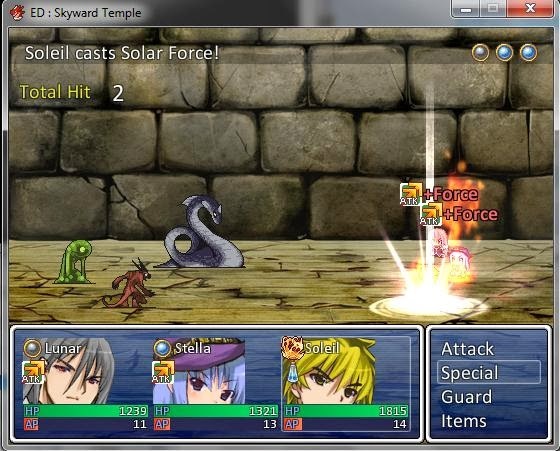 So It's possible if you want to put any style of HUD for your battle system. It's also compatible with YEA Free turn battle, and Sabakhan Ao no Kiseki BS, and formar ATB (It should go under my script), EST - Ring System, AEA - Charge Turn Battle. Luna Engine. Doesn't work with Ocedic Motion Battle Camera. In version 1.4, I tested the compatibility among various Yanfly Script. So, mine gonna be compatible with most of Yanfly's Include AoE or Lunatic series. Also, I have my own battle camera addon if you want. Q: Can I use holder battler? A: Yes, you can. But it will little bit troublesome. Since holder battler format has many rows in single battler image. I recommend you to split it up. Q: What do you mean by "Format is consistent"? A: No ... http://fc05.deviantart.net/fs70/f/2014/110/b/5/scripter_by_theoallen-d7fchsv.jpg But I will try if I like the script. As for Victor's scripts, it's a big NO. A: I don't mind. I made it for my personal use afterall. Q: What is the general ToU of this script? A: Simply credit me as TheoAllen. Q: May I use this script in Commercial games? A: Yes. And you have to give me a free copy of the game. Q: May I repost this script to other site? Q: May I edit this script? Q: May I take some money profit by editing this script? Q: May I translate the script to other language? Q: May I use this script for contest/challenge? A: If it's non-profit challenge, yes. If it's profit challenge (like monetary gain), then NO. Q: May I sell the third party script/addon? Mithran, for Graphical global object reference. If it's not by his script, I may not finish my battle system. TDS, I found your basic movement module script on RMRK long time ago. Then I adopt it and I rewrote by my own. I use in script editor to make sequence movement instead of too many notetags as Symphony and Victor's do. It because there're already many script that uses notetags and notebox itself has no scroll. I will be more active on VXAN. You will get a better quick answer if you ask me there than this site. My aim is to make it compatible with Luna Engine without extra patch. However, I haven't tested it with the latest version of TSBS. It's still beta version. In other word, it may have many issues. You may test the script, but if you're going into real development, I suggest you to use the stable version 1.3c instead. I haven't update the github at the moment. Considering it's still beta. Script must be taken by download the demo. I changed the config 1 and config 2 parts. So, you need to update them as well. Battle backdrop decoration addon is not translated yet. There're too many instructions that I can't really handle right now. Perhaps, sometimes. Also, it has a little glitch which I currently dunno how to fix. if you use Alarm Tone, in next battle that not use alarm tone, there 1 frame glitch where the screen blended with a wrong tone. TSBS version 1.4 will not updated. If you reported a bug, I will likely to make the patch instead. Battle music taken from Dragonic Symphony if you wonder. Want to use the map BGM? That's mine, go ahead if you want to use. And you need to credit me as well. After these hardworks, I will likely to take a very long break and will not touch anything complex related with the battle system (unless I choose to). But I will still provide the support for TSBS as long as I'm avalaible. Ebanyle, TheTitan99, Isabella Ava and 33 others like this. I was wondering, will you make a timed-hit system like Eremidia? You're almost forcing me to change from Symphony to your battle system. Anyway, I wish you the best and good luck with all your scripts. DragonX611 and TheoAllen like this. ninjalex and TheoAllen like this. I'm busy lately. Couldn't really look after this script. But I will try to manage this script even a little everyday. Holy crap this looks cool. I doubt I could ever get this to work with so many scripts I'm using but still sweet looking. I hope that won't happen like happened with Victor's system and... I don't remember the creator's name of Battle Symphony... that haven't fixed some important bugs, forgetting their scripts... due this cause, I haven't continued with my project. If I recover the will of make a new project with the RPG Maker, I will use your battle system, I hope that you script improves a lot, and that never is forgotten! No, I hope it won't forgotten. It's my masterpiece and I still have many things on its update list. If you found a bug, tell me. But if it's compatibility, I'm not sure. hooo...since is like a Neo-tankentai for vx ace? I haven't made my own. Btw, I just added check collapse feature inside action sequence. Yes, it was inspired from tankentai. Taken from "Can Collapse" function from RMVX version. Creator of engine Symphony is dr.yami. Wow. This is a really nice script. I don't know why there isn't too many comments here. Probably because it's a little more difficult than some other battle systems, I prefer it be a secret, that way it's not over used and under valued! It truly is awesome!